A fantastically bright repeating radio signal from billions of light-years away has been discovered, only the second of its kind ever found. Scientists now believe these signals are much more common than previously thought. The signal is a fast radio burst (FRB), one of only 60 of such mysterious blips ever recorded in the past 13 years, and its repetition sheds some light on the tantalizingly mysterious origins of these millisecond-long, intense bursts. Scientists at the Canadian Hydrogen Intensity Mapping Experiment (CHIME) radio telescope were able to pinpoint its location about 1.5 billion light-years from Earth over the course of six repetitions. Like the previous repeater, detected in 2012, CHIMEs FRB rules out the possibility that the bursts are coming from “cataclysmic events.” Six bursts originating from the exact same place but taking place over several months could not emanate from the same exploding star. And the existence of a second repeater means 2012s was not a fluke or an instrument error – something is producing these repeating bursts of light, and its clearly fixed in place over long periods of time. “With more repeaters and more sources available for study, we may be able to understand these cosmic puzzles – where theyre from and what causes them,” said Ingrid Stairs, an astrophysicist at the University of British Columbia. Including the repeater, CHIME picked up a total of 13 new FRBs over the course of two months. Seven of those were measured at the lowest frequency yet detected, suggesting that there could be even more of them at frequencies too low to measure. FRBs offer researchers a clue as to what kind of matter comprises the vast gulfs of seemingly empty space between galaxies. Whatever the photons pass through, that interaction is recorded in the radio waves and can be “translated” after its received by the telescope. CHIME scans the entirety of the Northern Hemisphere every day and is expected to pick up dozens of FRBs per month when operating at full capacity. In 2017, Harvard scientists wrote a paper explaining how the pulses could originate with a giant radio transmitter built to power a light-sail-equipped spacecraft. 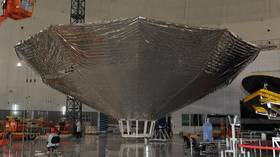 The authors of that paper resurfaced recently to point out that the interstellar object that had all the astronomers talking when it passed through our solar system – Oumuamua – strongly resembled an alien light-sail. “Its still too early to tell for sure,” he said.